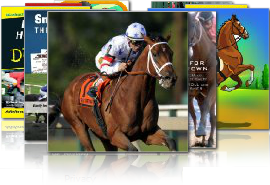 Our racenight packages are very similar to the ones you traditionally buy from physical providers, the only difference being that you will be downloading these services to your computer. Once you have tested to ensure that our package work, it is then simply a matter of selecting a race package that you require. Most of our customers go for an 8 race package. This lasts approximately 3-3.5 hours but this timescale is dependent upon how quickly you can process the betting at your event. The race’s average duration is approximately 5 minutes from start to finish. Once you have made your purchase, you will then be asked to download the race package to the computer that you will be using at your event. Please be aware that the file you will be downloading is a .exe file. These have traditionally been associated with viruses. However, this package has been virus scanned and is currently free from any defects or malicious code. Unfortunately this is the only way we can secure our packages from piracy. Once you have downloaded the package and started it, you will then be provided with a screen that has your computer’s identity code which you will need to copy and paste into the weblink that you will receive. This website will then give you a security code for your racenight which you will then need to copy and paste into the player. You are then good to go!! This will allow you to test the racenight to see if it functions correctly prior to your event and gives you two extra uses of the package. Insert picture of tote ticket. The tote tickets PDF come in pages of 30 tickets per horse per race. All you need to do is print these tickets out and cut them up and you are ready to go. The racenight programmes contain made up race names and humorous horse names . We also include a Word file where you can make up your own horse and race names which you can sell to your punters to raise additional funds for your event. All of this is fully downloadable. This is free money to give away at your event when you don’t want to use real cash. You can download this as part of your package and I would recommend that perhaps you change the centre piece of each of these notes to members of your committee or, if you are running your event for a birthday party, perhaps pictures of family members with the birthday person’s picture on the highest denomination note. The choice is yours. The pay-out calculator is used to work out how much you need to give back to your winning punters at the end of each race. The calculations are very easy and we also have a downloadable Easy Tote Calculator which is an Excel spreadsheet which you can use to work out live time odds during your event as the bets are taken. This is a simple way of doing forecast betting so your horse or pig selection has to come first or second for you to be the winner. This is a great thing to have in your club house or venue prior to your event to get people interested and motivated to come along to your racenight. This is very similar to the double sheet except to be the winner you have to get first, second and third. Again this is a great way to motivate people to come to your event but if they can’t make it you can always ask them to make a contribution any way. The best thing to do is to have a look at both the Double Sheet and Tri-cast Sheet as a picture says a thousand words. How Race Nights Are Ideal and Effective For Fundraising? how to raise funds with amazing fundraising ideas! How to successfully organize a race for a charity? Race-night offers an amusement event that should not be used for the purpose of illegal gambling. If your group intends to use real money for fund-raising, please check with your local authorities regarding their permits, rules and regulations. All users of our service agree to check with the local authorities to ensure that the event that they intend to run is within the law. Users of our service agree to our terms and conditions and the placing of an order is the clients agreement to our terms.